ATTENTION: To use Stardome, export the best laps from DigiRace-MMX and create the ".sdm" files you wish to upload on our player. If you have not registered yet, you can display the user's laps "DEMO" only. VIEW LAP:Click on this button to DISPLAY every SINGLE LAP. LAP LOCKED: The user may display this lap only AFTER HAVING MADE the Stardrome REGISTRATION. Follow the GUIDED PROCEDURE for registration and immediate access. To load the best laps and compare them with the other users’, register and create your own account. All registered users will be referred to as "Starlaners". To register, fill in the form with all required data. PLEASE NOTE: Stardrome's purpose is merely technical and not commercial. As a consequence, the username may not refer to Internet sites or other business activities. The password and user-id for access to Stardrome will be automatically sent to the mailbox you have entered. If you register, you can also receive our NEWSLETTER for information on STARDROME and STARLANE news (you just have to select “I wish to receive the newsletter from STARLANE S.r.l."). The first time you login, select "Session unlimited". This means that the system can remember user-id and password at any time and that you are not required to enter them whenever you access www.stardrome.com. If necessary, you can modify the data you have entered during the registration. Add your PHOTO: it will appear next to your lap for better identification. - Image format admitted: .JPG, .GIF. - File size: not higher than 2MB. This section will enable you to manage all the vehicles used to perform the sessions on the track; before loading the .sdm file, create the VEHICLE (or the VEHICLES if you have done the laps by using several vehicles). Click on "» Add a vehicle to your VEHICLE FLEET" for entry. Fill in the form as required. PLEASE NOTE: if there is not the “type of vehicle”, “manufacturer”, “model” and/or “cylinder capacity” you wish to complete the vehicle, you can make a suggestion e.g. by clicking on "Enter a type of vehicle". In doing so, you can add a new vehicle. The VEHICLE FLEET management will enable you to hide, modify and remove your own vehicle. To show that the vehicle is VISIBLE and that all the laps you have loaded and associated to this vehicle will be displayed. To show that the vehicle is HIDDEN and that all the laps you have loaded and associated to this vehicle will NOT be displayed. Click on button "DELETE" to delete a vehicle once and for all and, as a consequence, the laps associated with this vehicle will be no longer visible. Click on button "MODIFY" to modify the vehicle data you have entered before. To load the laps on Stardrome, export the .sdm file from DigiRace-MMX with the best lap. Load the trial session in DigiRace-MMX. Click on the STARDROME key in the Export tab you find on the button bar on the right. Select a name for the lap that will be saved in the predefined folder C:\Digirace\Stardrome. After having obtained the .sdm file with the best lap, click on "Load laps" from the Starlaner Panel. and load the .sdm FILE EXPORTED from DigiRace-MMX. PLEASE NOTE: You can only load ".sdm" files. You will not be allowed to load other files. PLEASE NOTE: If you have done the lap on a track not made available in the archive, you will be automatically required to add the new track. Fill in “Name”, “Country” and “Province” and click on “Send” to continue. Click on "SEND" to continue. You will be required to enter "LAP NOTES", where to type personal comments, weather conditions, etc. 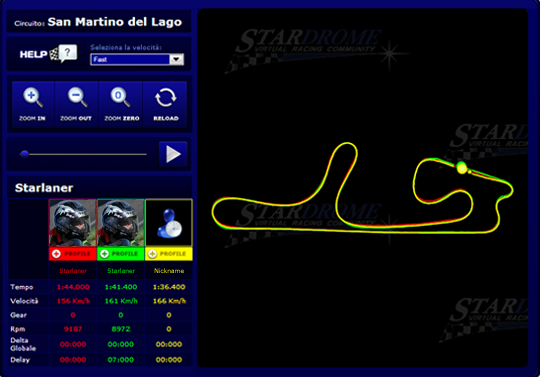 Now, the lap is properly loaded and Stardrome will automatically display other users’ laps for comparison (selected on the basis of the same track and vehicle). Click on "COMPARE" to start the comparison (you can also select one single lap and display it individually). The display will automatically show the window with the Player that serves to compare laps. to position the Markers on the "starting line"
The Starlaners, which have taken part in the comparison, are listed at the bottom, along with some technical data, such as the lap time, speed, gear. Click on the track to set the "virtual start", i.e. to align the Markers in a point of the track other than the real start, signalled by the VIRTUAL START icon. You can display and modify your own laps in the “LIST OF LOADED LAPS” item of the STARLANER PANEL. 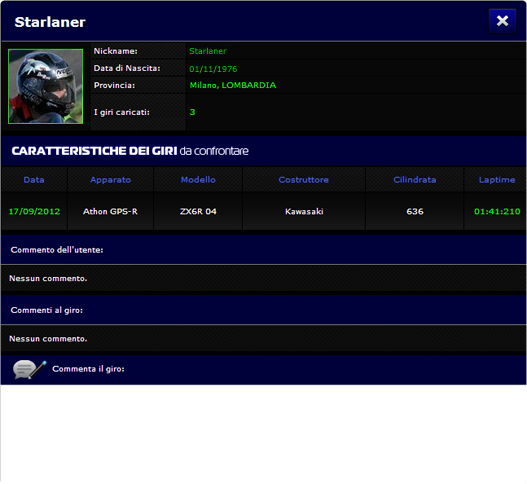 After having registered and accessed Stardrome, you can compare your own laps with other Starlaners’. Similarly, you can make a comparison between your own laps and/or between other Starlaners’ laps only. PLEASE NOTE: You can compare MAXIMUM 3 LAPS at the same time. You can filter the laps for comparison by means of the pop-down menu where to select the TRACK. You will only display the tracks associated with the laps you have loaded. You can SEARCH and compare the laps you have found in the “COMPARE LAPS” item of the main menu (on the top). The fields "Type of vehicle:" and "Track:" are compulsory. The others are optional and intended to refine the search. Click on "SEARCH" to continue. The list of the laps you have filtered will appear on the screen; select max. 3 for comparison (you can always display only one). After having loaded a lap, Stardrome will automatically display a list including the laps similar to your own in terms of TRACK and TYPE OF VEHICLE.